The men holding the nooses around the dog, show no mercy even though the dog, clearly suffocating, thrashes around. Long before they reach a parked van, the dog collapses. The dog catchers show no remorse as they drag the dog from two wire nooses. The dog later died. Chennai: Heart-wrenching visuals of a dog being strangled, posted on Facebook, has triggered shock in Chennai - a city that had been left outraged last year when two medical students filmed themselves throwing a mongrel down from a terrace. 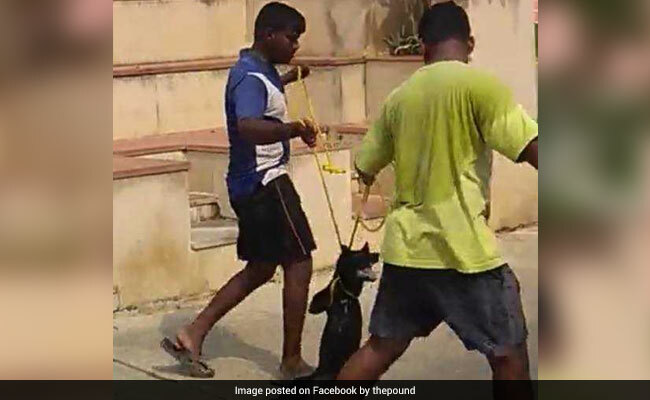 The cellphone video - shot in the campus of Vellore Institute of Technology -- shows a black dog being dragged down a flight of stairs, two wire nooses wound tight around its neck. The men holding the nooses show no mercy even though the dog, clearly suffocating, thrashes around. Long before they reach a parked van, the dog collapses. Locals say the men work for the Tambaram municipality in Chennai and were part of a dog-catching squad. Dawn William from the Blue Cross, who filed a complaint with the police against the college and the municipality, said it is not known what the men were doing in the campus, since it does not come under the civic body's jurisdiction. "What made them come there we don't know...We understand they caught eleven dogs this way. They are not saying where they buried the dog," he said. The university authorities were not available for comments. The Kancheepuram police said they were investigating the matter. Last year, the outraged city had tracked down the medical students who threw the dog from the terrace of their two-storied apartment. Not only were they fined by a court, the private medical college they attended also suspended them. The dog, which had broken a limb, was rescued and adopted by an activist.